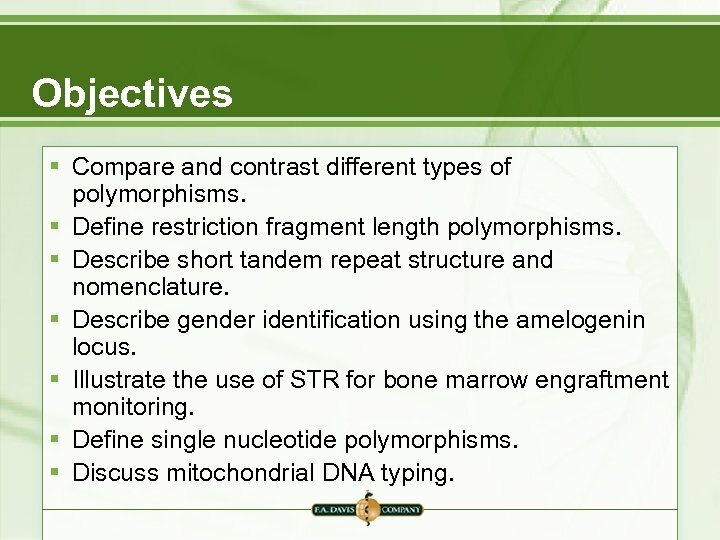 Objectives § Compare and contrast different types of polymorphisms. 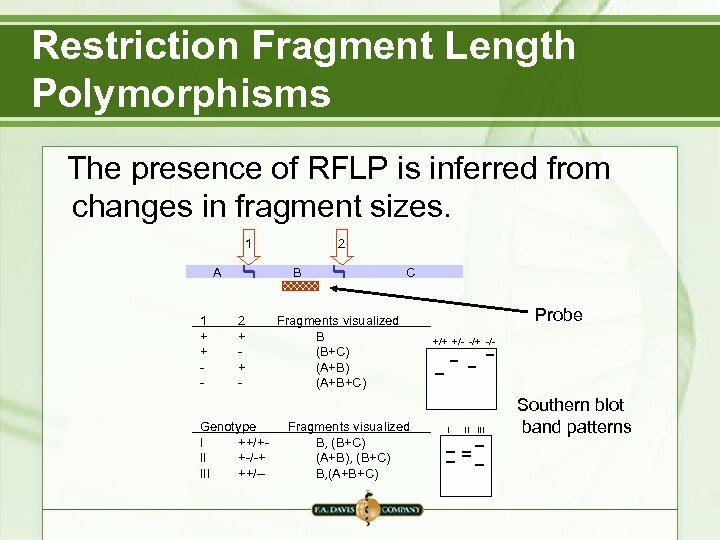 § Define restriction fragment length polymorphisms. 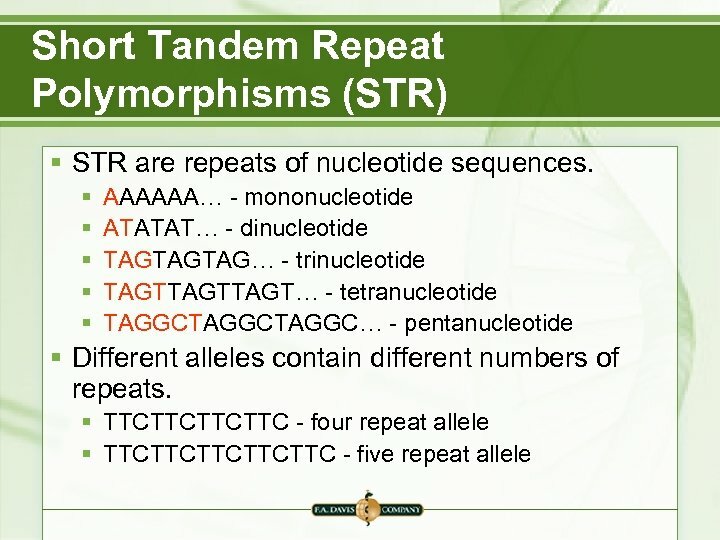 § Describe short tandem repeat structure and nomenclature. 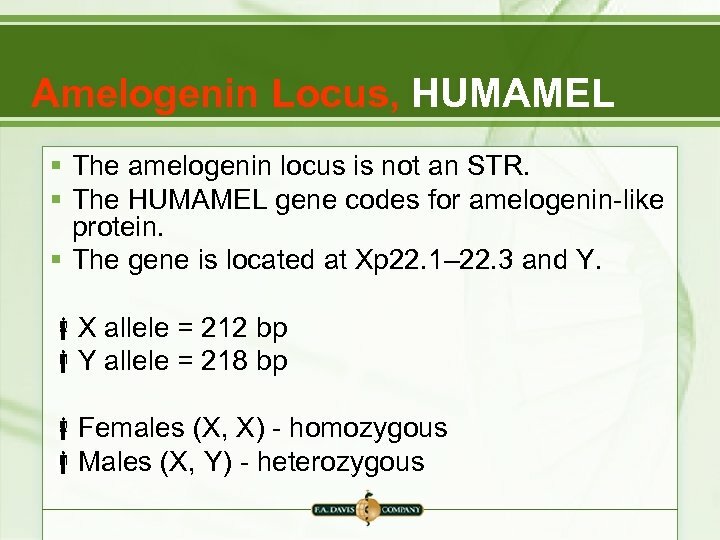 § Describe gender identification using the amelogenin locus. 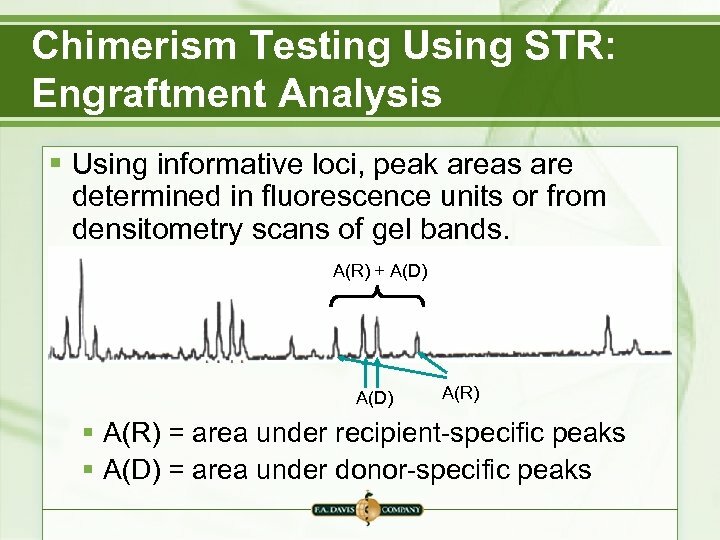 § Illustrate the use of STR for bone marrow engraftment monitoring. 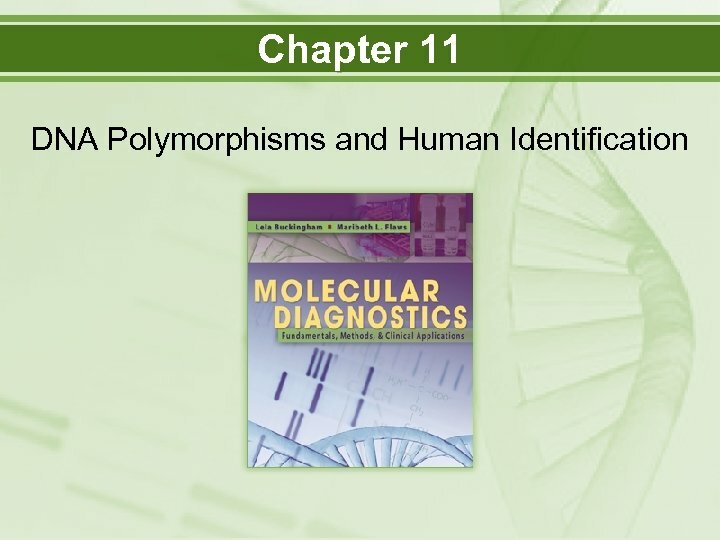 § Define single nucleotide polymorphisms. 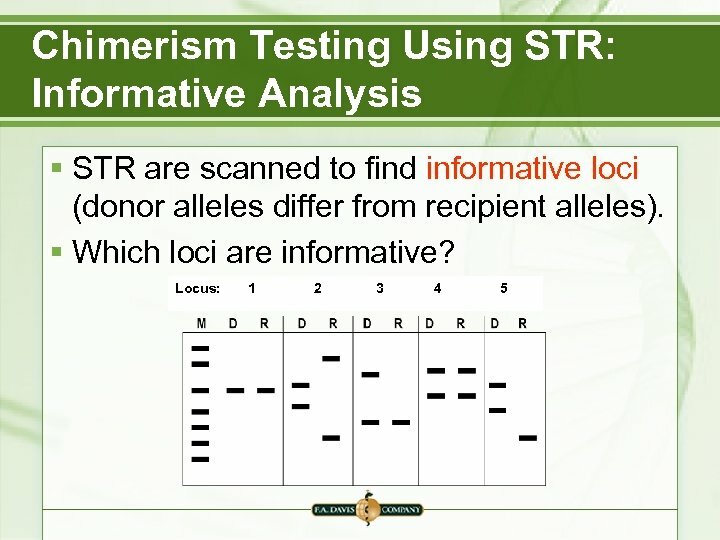 § Discuss mitochondrial DNA typing. 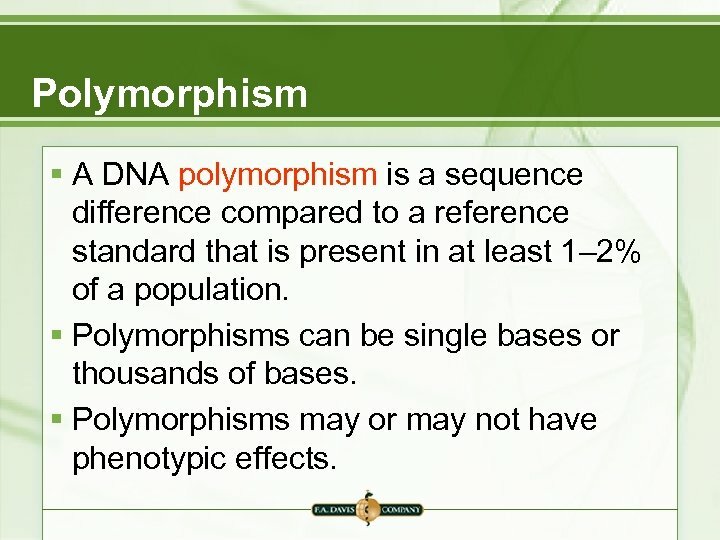 Polymorphism § A DNA polymorphism is a sequence difference compared to a reference standard that is present in at least 1– 2% of a population. 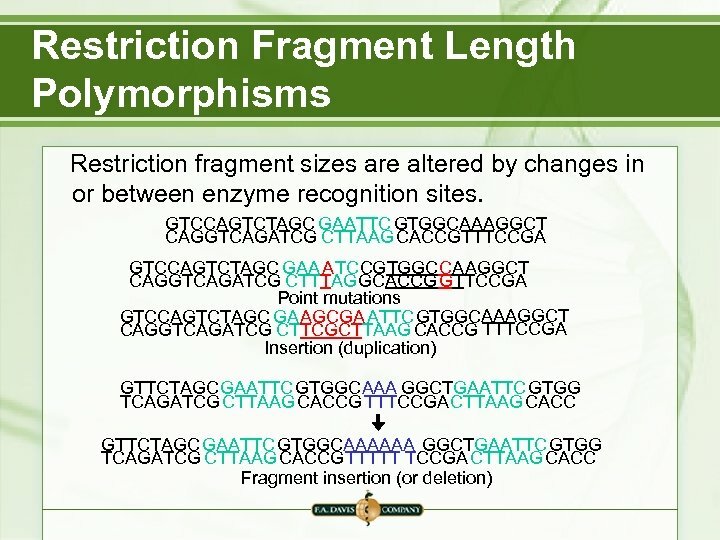 § Polymorphisms can be single bases or thousands of bases. 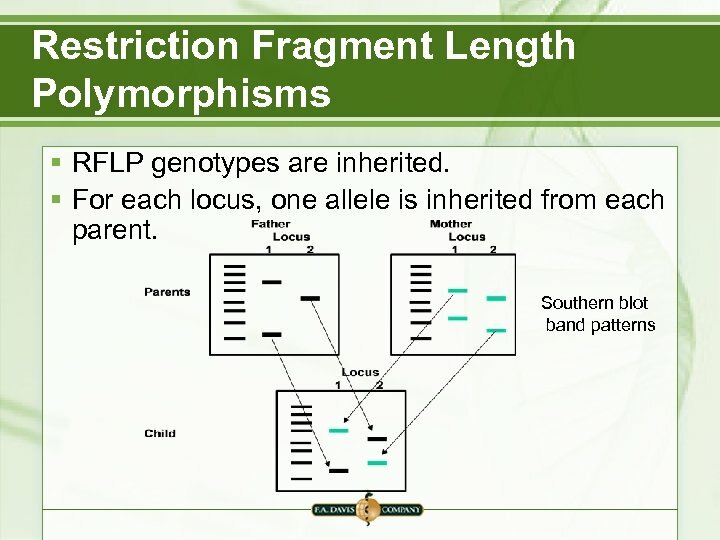 § Polymorphisms may or may not have phenotypic effects. 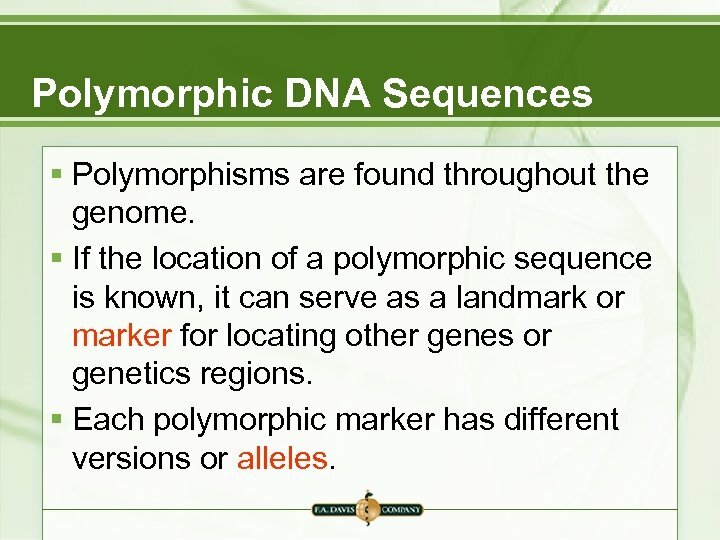 Polymorphic DNA Sequences § Polymorphisms are found throughout the genome. 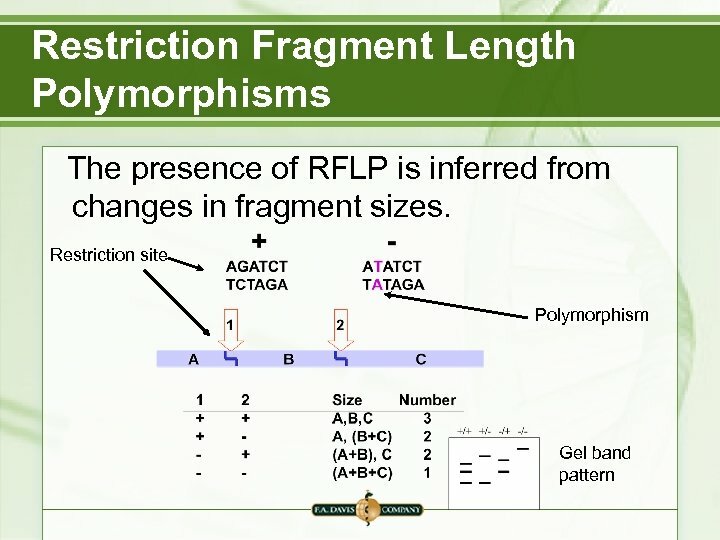 § If the location of a polymorphic sequence is known, it can serve as a landmark or marker for locating other genes or genetics regions. 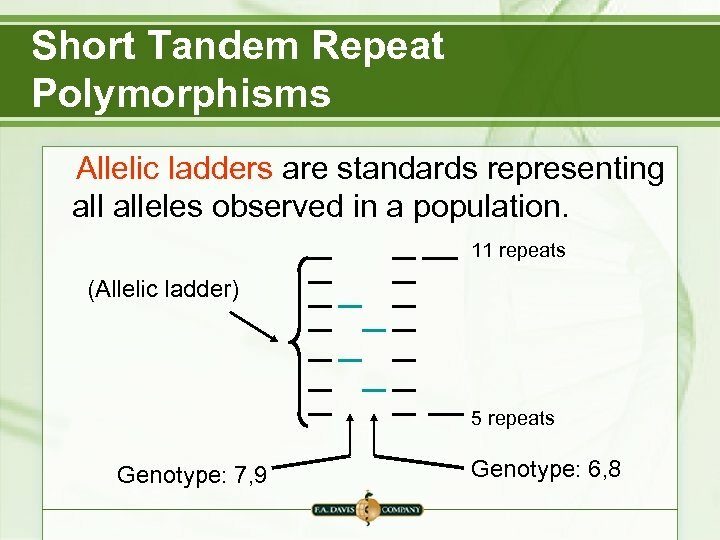 § Each polymorphic marker has different versions or alleles. 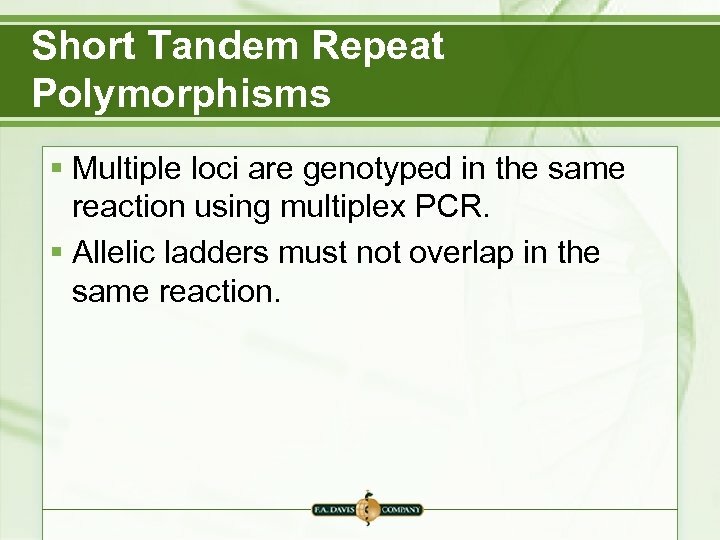 Short Tandem Repeat Polymorphisms § Multiple loci are genotyped in the same reaction using multiplex PCR. § Allelic ladders must not overlap in the same reaction. 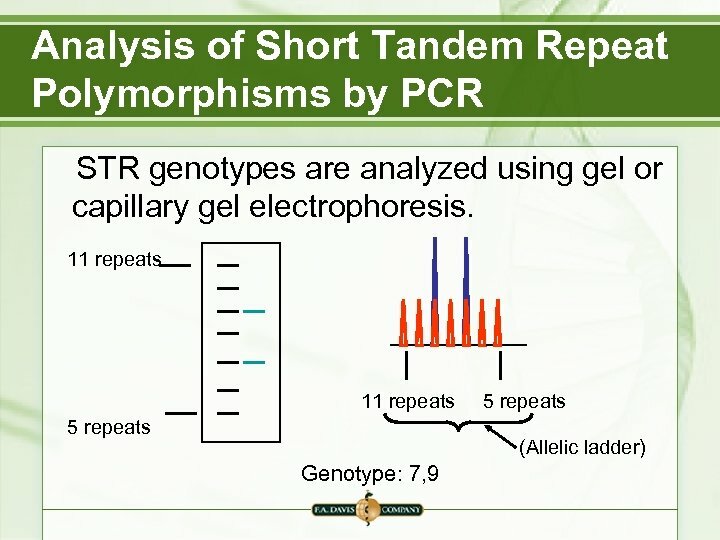 STR-PCR § STR genotypes are inherited. 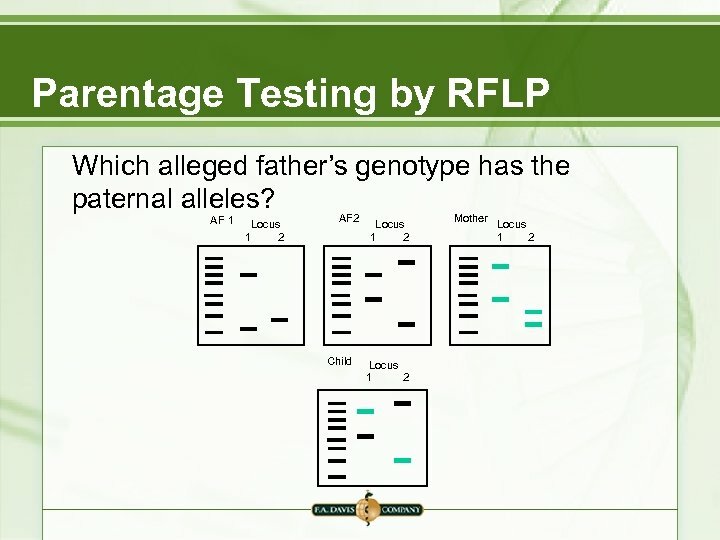 Child’s alleles Mother’s alleles Father’s alleles § One allele is inherited from each parent. 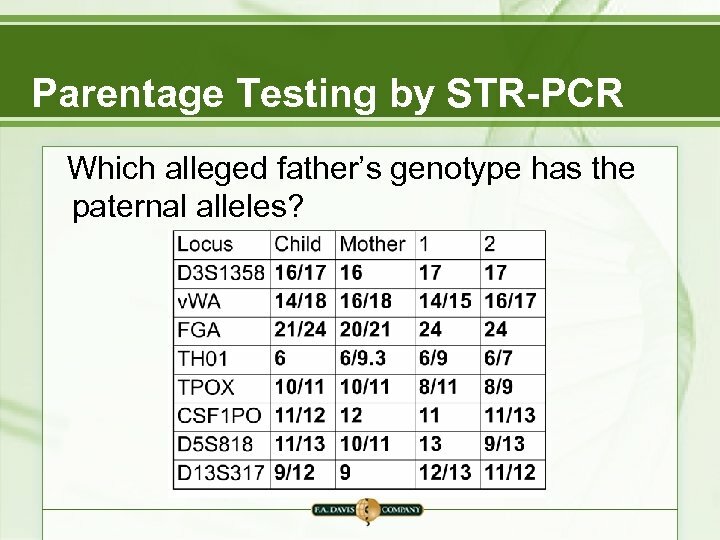 Parentage Testing by STR-PCR Which alleged father’s genotype has the paternal alleles? 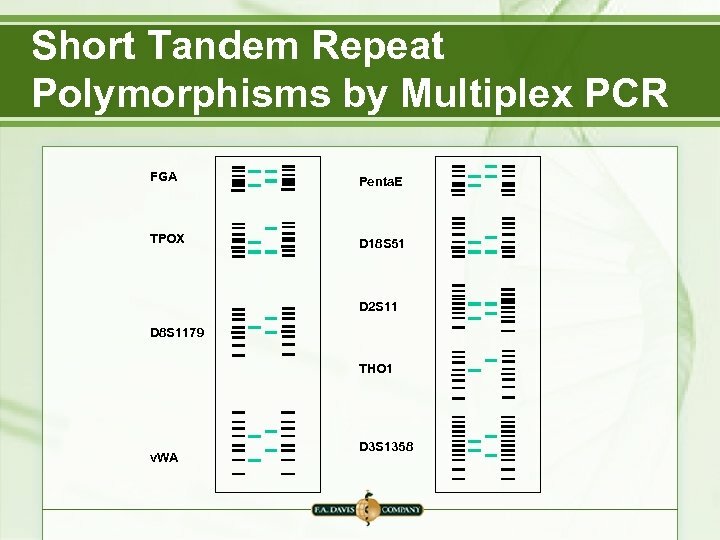 Short Tandem Repeat Polymorphisms: Y-STR § The Y chromosome is inherited in a block without recombination. 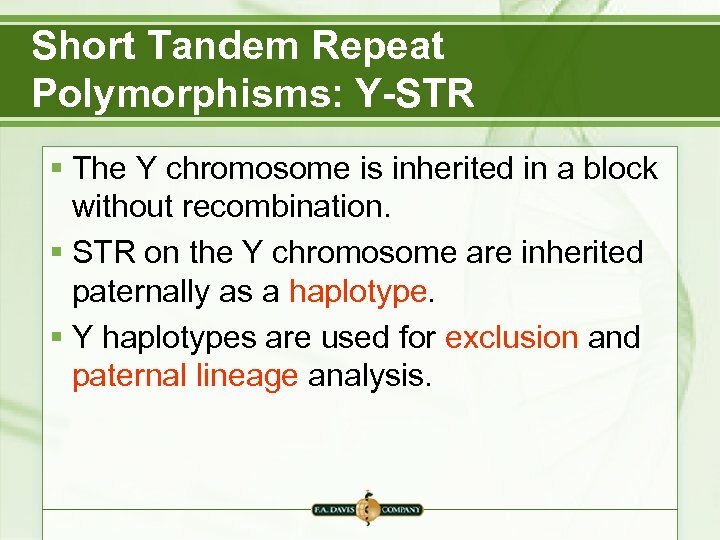 § STR on the Y chromosome are inherited paternally as a haplotype. § Y haplotypes are used for exclusion and paternal lineage analysis. 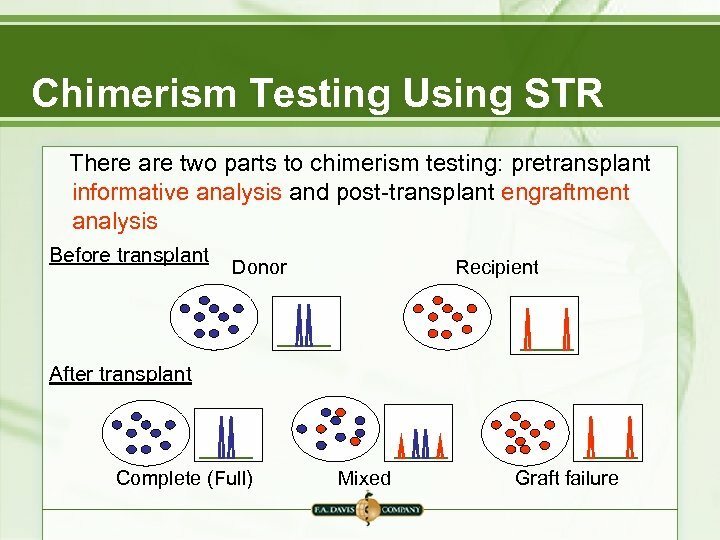 Chimerism Testing Using STR Allogeneic bone marrow transplants are monitored using STR. 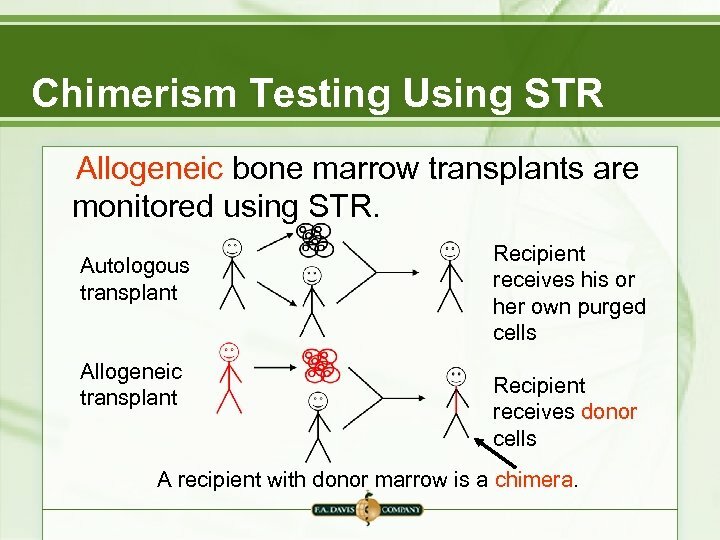 Autologous transplant Allogeneic transplant Recipient receives his or her own purged cells Recipient receives donor cells A recipient with donor marrow is a chimera. 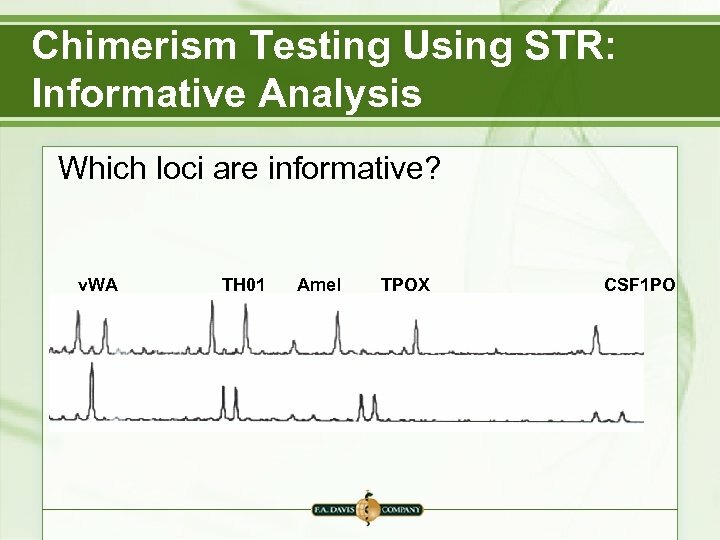 Chimerism Testing Using STR: Informative Analysis § There are different degrees of informativity. 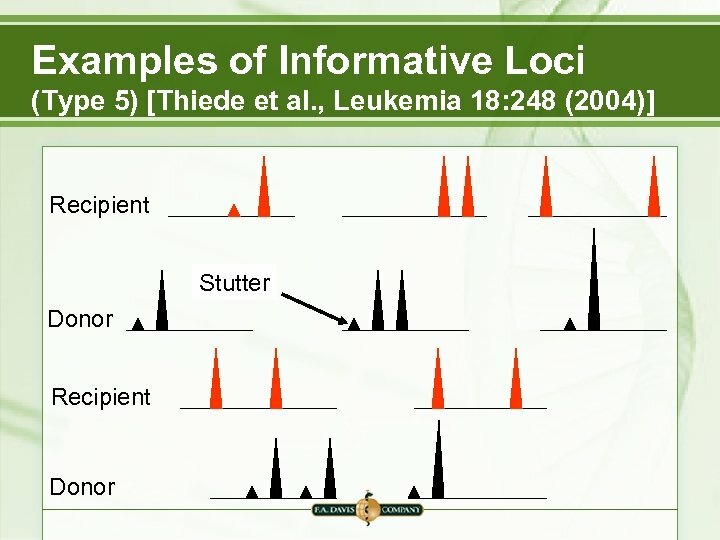 § With the most informative loci, recipient bands or peaks do not overlap stutter in donor bands or peaks. 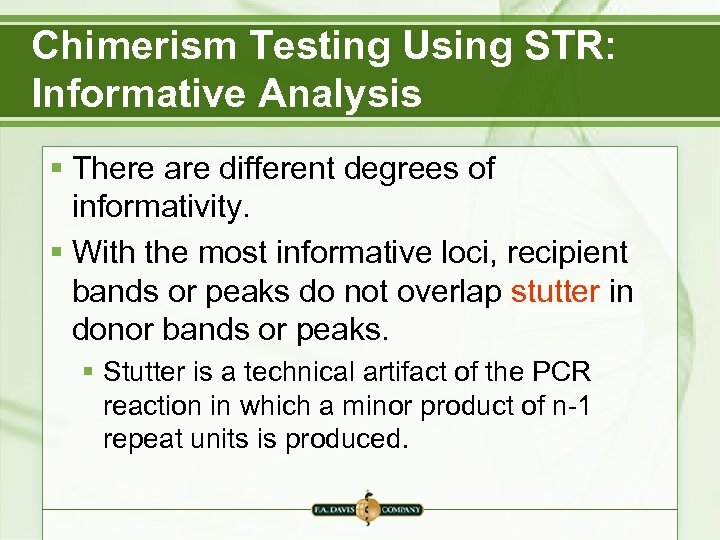 § Stutter is a technical artifact of the PCR reaction in which a minor product of n-1 repeat units is produced. 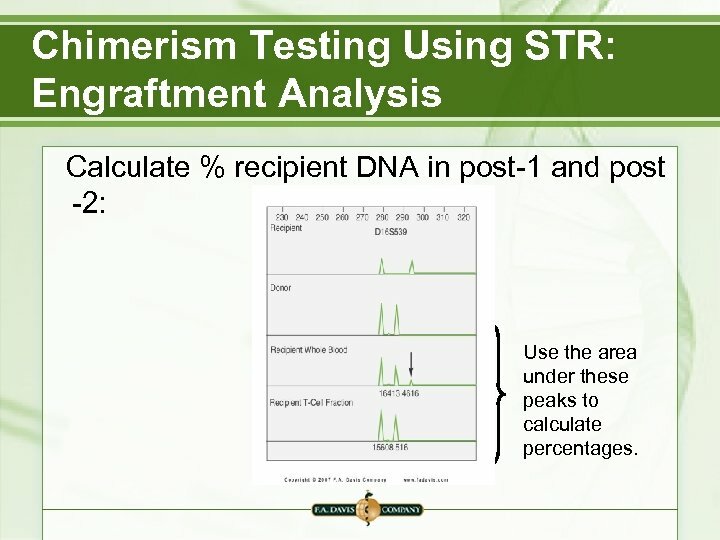 Chimerism Testing Using STR: Engraftment Analysis Calculate % recipient DNA in post-1 and post -2: Use the area under these peaks to calculate percentages. 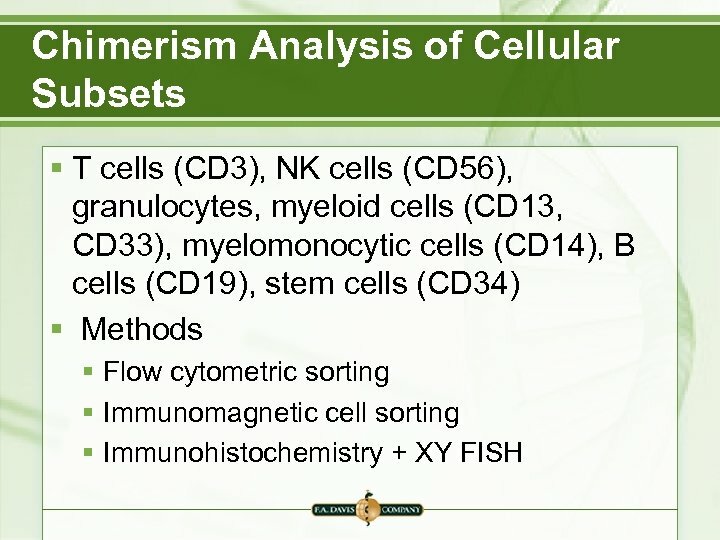 Chimerism Analysis of Cellular Subsets § Cell subsets (T cells, granulocytes, NK cells, etc. ) engraft with different kinetics. 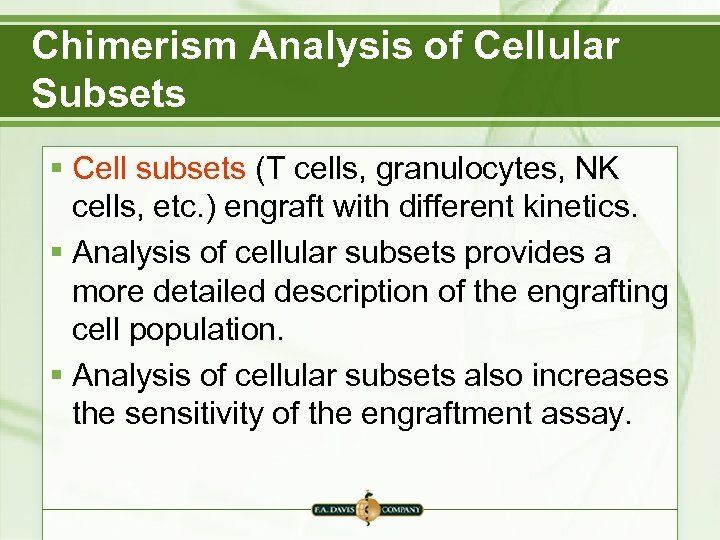 § Analysis of cellular subsets provides a more detailed description of the engrafting cell population. 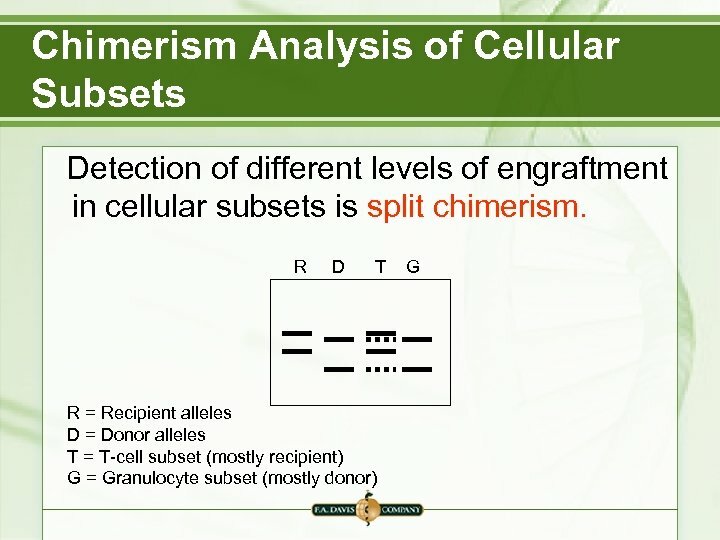 § Analysis of cellular subsets also increases the sensitivity of the engraftment assay. 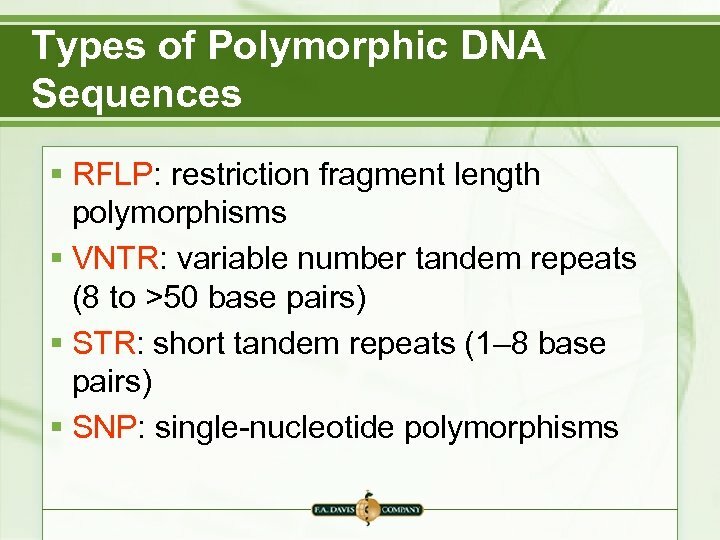 Single Nucleotide Polymorphisms (SNP) § Single-nucleotide differences between DNA sequences. 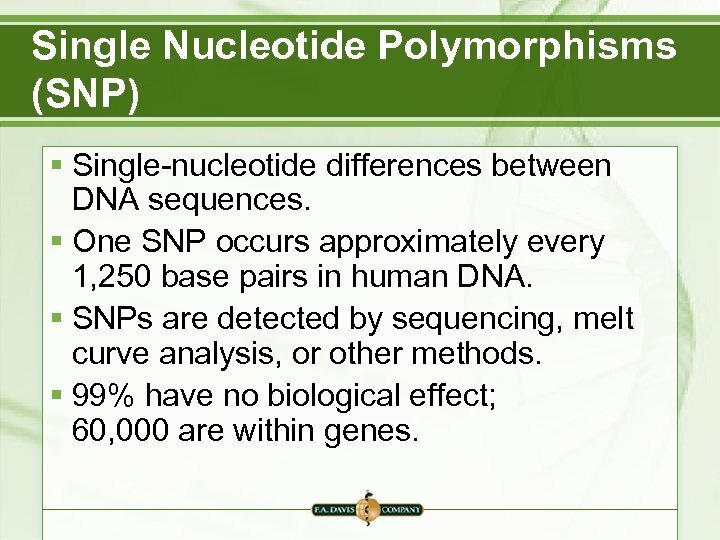 § One SNP occurs approximately every 1, 250 base pairs in human DNA. 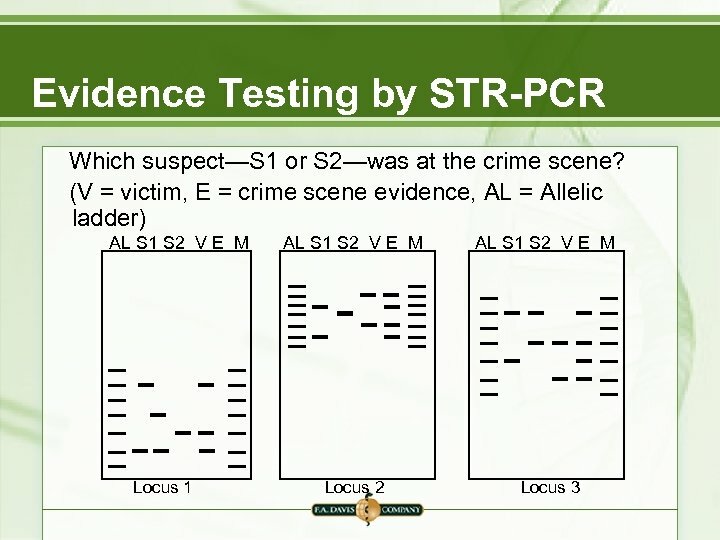 § SNPs are detected by sequencing, melt curve analysis, or other methods. § 99% have no biological effect; 60, 000 are within genes. 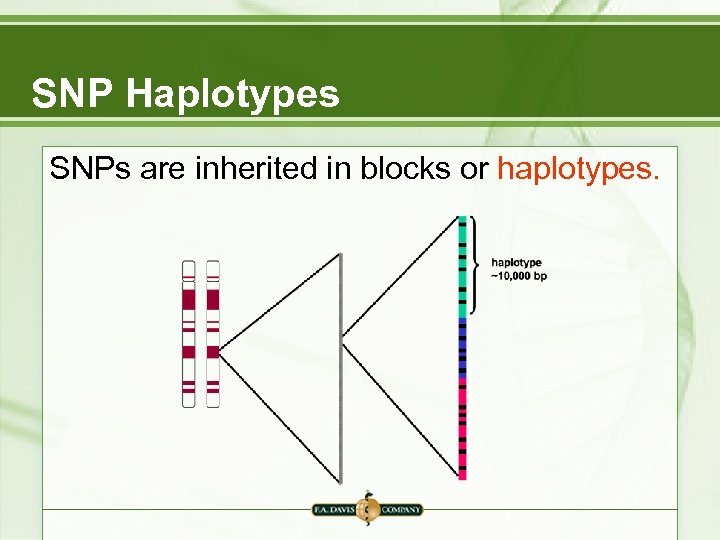 SNP Haplotypes SNPs are inherited in blocks or haplotypes. 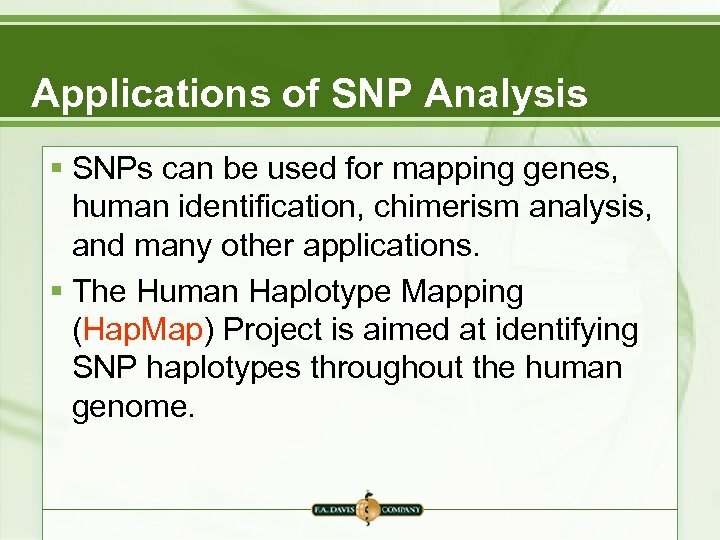 Applications of SNP Analysis § SNPs can be used for mapping genes, human identification, chimerism analysis, and many other applications. 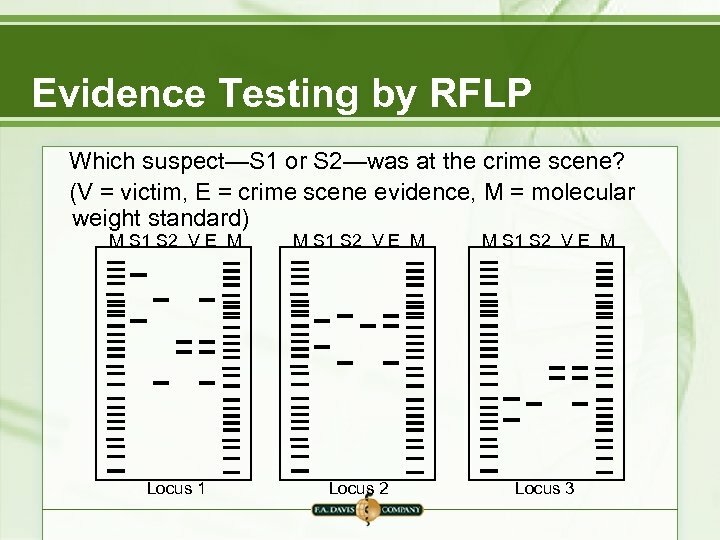 § The Human Haplotype Mapping (Hap. Map) Project is aimed at identifying SNP haplotypes throughout the human genome. 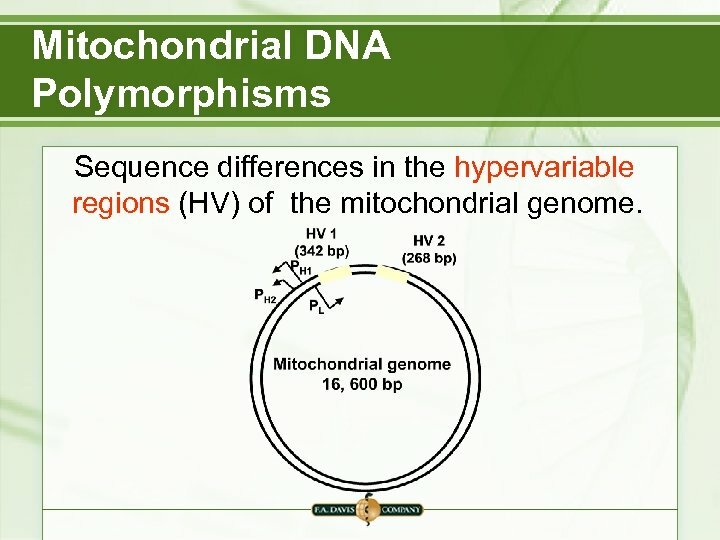 Mitochondrial DNA Polymorphisms Sequence differences in the hypervariable regions (HV) of the mitochondrial genome. 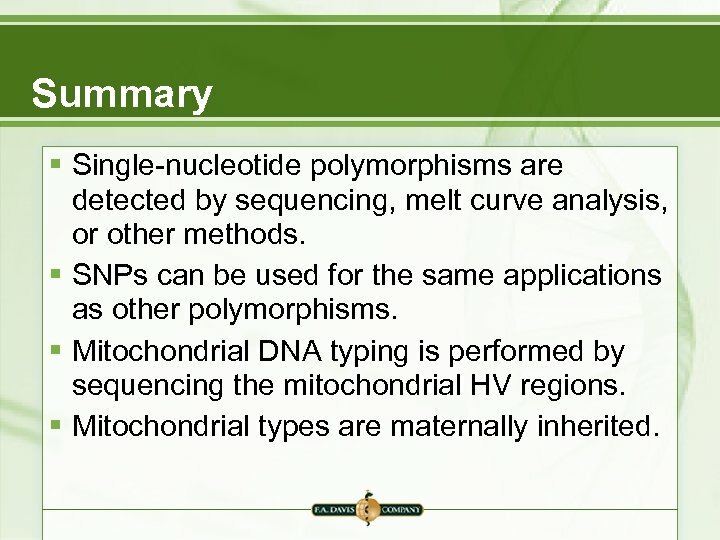 Mitochondrial DNA Polymorphisms § Mitochondria are maternally inherited. § There an average of 8. 5 base differences in the mitochondrial HV sequences of unrelated individuals. 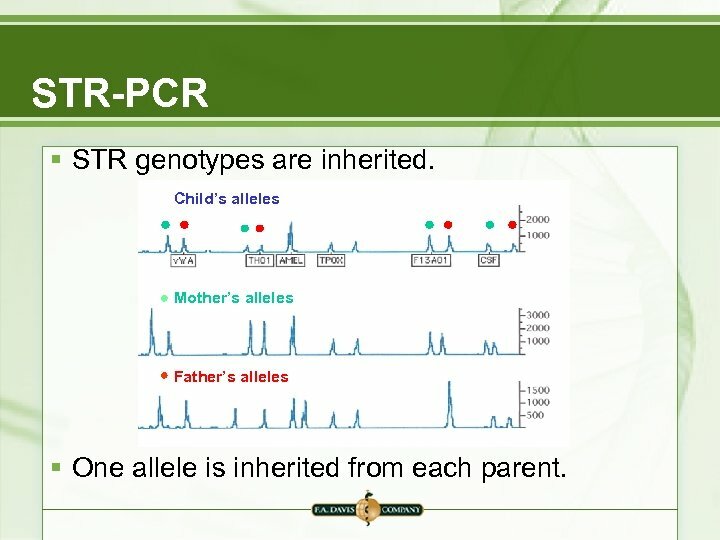 § All maternal relatives will have the same mitochondrial sequences. § Mitochondrial typing can be used for legal exclusion of individuals or confirmation of maternal lineage. 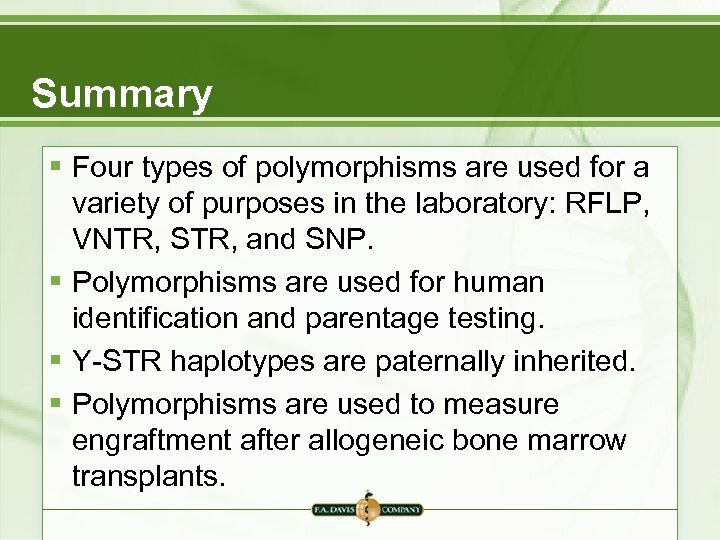 Summary § Four types of polymorphisms are used for a variety of purposes in the laboratory: RFLP, VNTR, STR, and SNP. 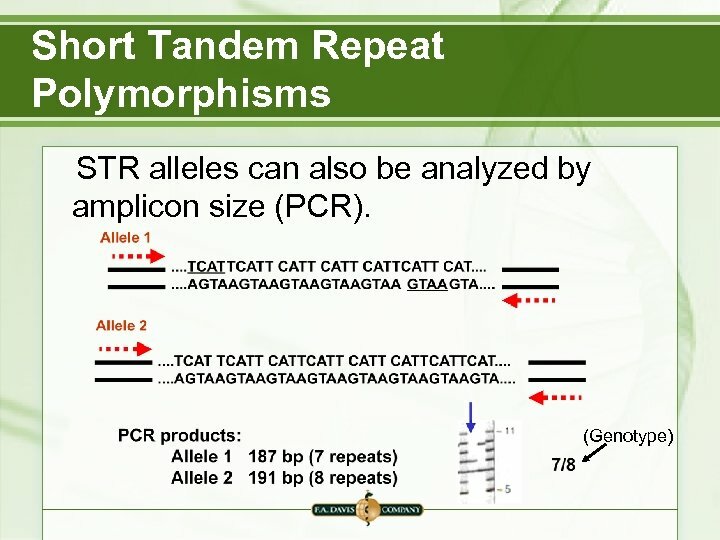 § Polymorphisms are used for human identification and parentage testing. 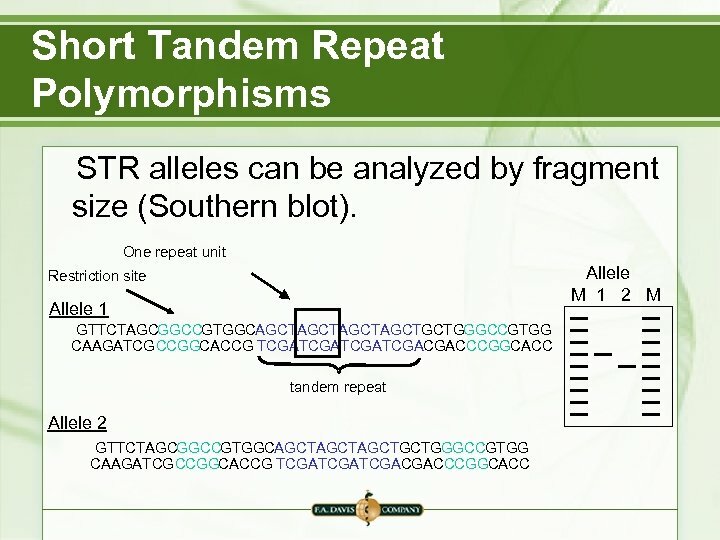 § Y-STR haplotypes are paternally inherited. 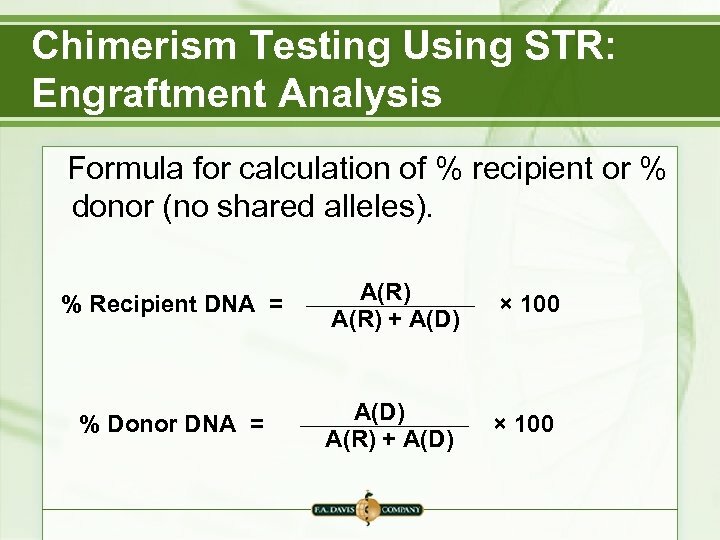 § Polymorphisms are used to measure engraftment after allogeneic bone marrow transplants. 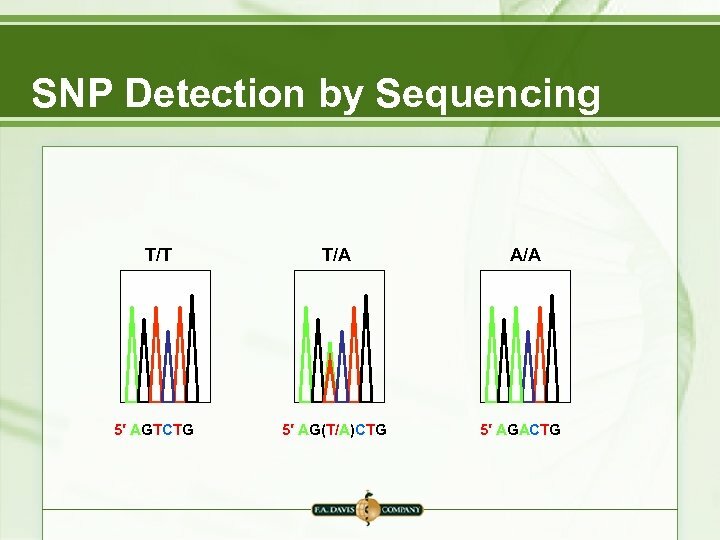 Summary § Single-nucleotide polymorphisms are detected by sequencing, melt curve analysis, or other methods. 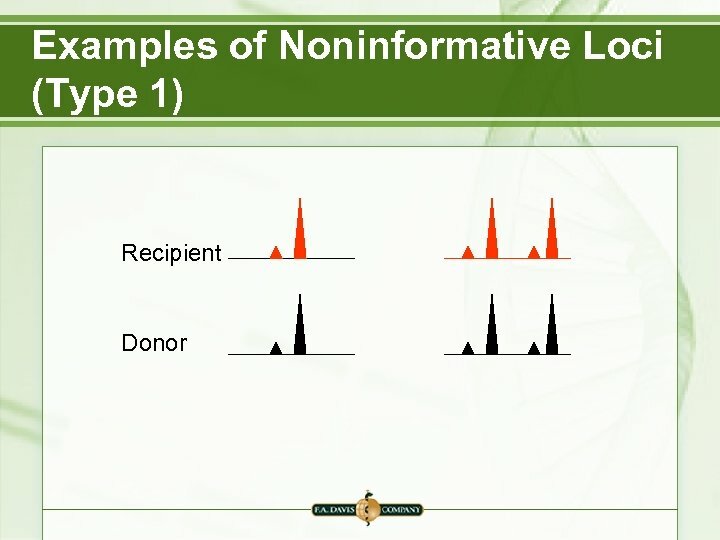 § SNPs can be used for the same applications as other polymorphisms. § Mitochondrial DNA typing is performed by sequencing the mitochondrial HV regions. 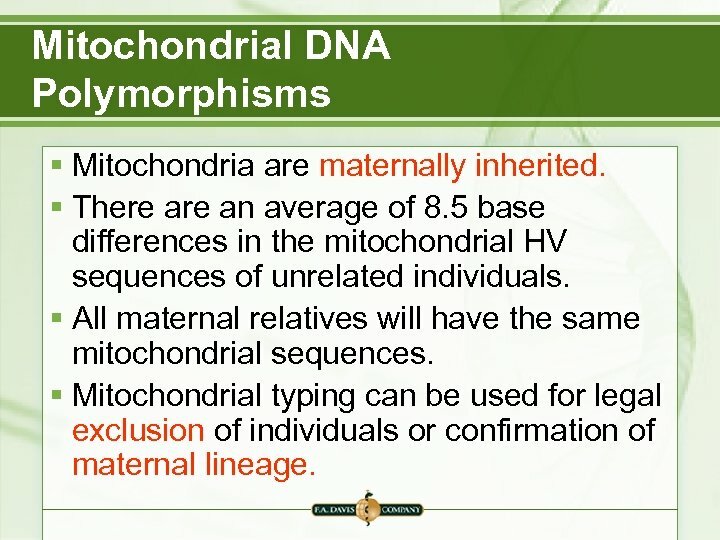 § Mitochondrial types are maternally inherited.